The Kathy Davis weekly planner refill features colorful artwork with inspiring quotes for motivation to stay organized all year long. Its dated pages run 12 months from January - December with one week per two page spreads and appointment times for clear planning. Hourly appointments are listed from 8: 00 a.M. - 5: 00 p.M. Monday - Friday and 8: 00 a.M. - 12: 00 p.M. On Saturday and Sunday. Refill includes inspiring quotes from Kathy Davis featured on each weekly spread. Its colorful, monthly tabs make it easy to find any date at a moment's notice. Coordinating page locator also included. Refill is 7-hole punched for use with a desk size planner cover. 5-1/2" x 8-1/2" page size. 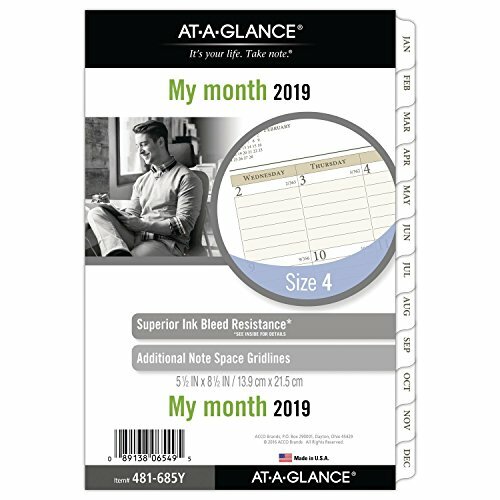 Replace or add monthly calendars into your planner with loose-leaf At-A-Glance day Runner monthly planning pages. 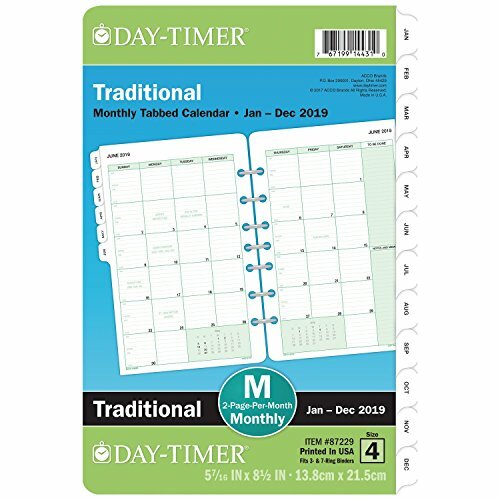 These size 4 calendars are laid out with one month per two page spread and are tabbed to allow quick turning to any month. The 12 month calendar pages include world holidays and run from January to December. Julian dates. Each monthly calendar features ruled daily blocks to help keep you handwriting neat on the Sunday - Saturday format and a ruled notes column to jot down to-do's and important information. Past and future month calendar reference blocks are also shown. 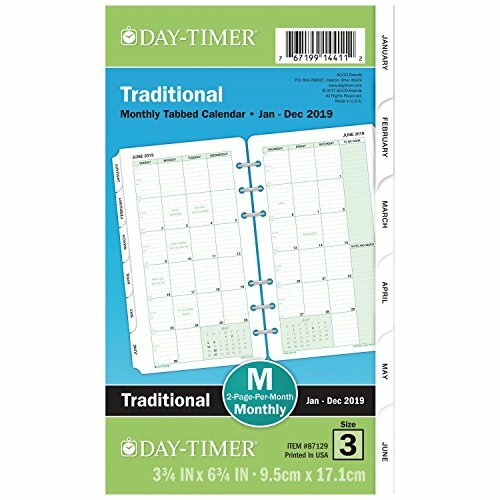 Each loose-leaf calendar page is 5-1/2" x 8-1/2" and pre-punched with 7 holes for use with size 4, 7 ring At-A-Glance day Runner Pro planners. Monthly planning pages are constructed from white paper with 30% post-consumer waste. 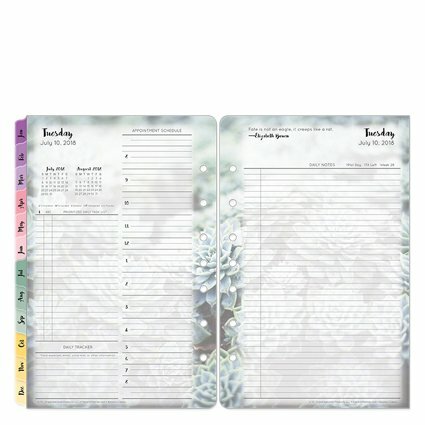 At-A-Glance day Runner nature planner refill pages feature floral images on each page as part of the At-A-Glance day Runner express nature collection. 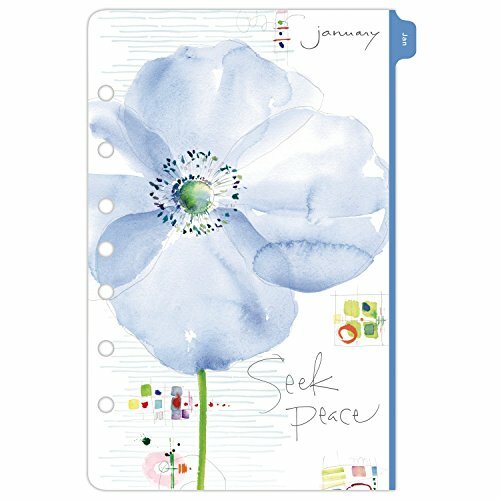 Each quarter brings a new design and color to your pages to help preserve your Peace of mind while trying to manage a busy schedule. The two page per month format is easy to follow, with plenty of room for planning. 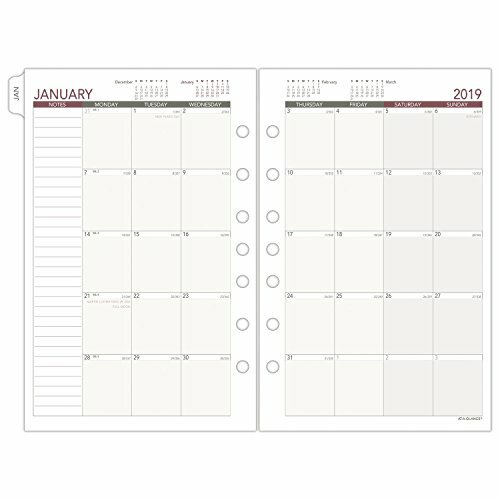 Monthly calendar pages are dated January - December and have tabs to easily locate your current month. Unruled daily blocks are in a Sunday - Saturday format with highlighted weekends. Past, current and two future month reference calendars are included on each monthly spread as well as a useful ruled column for notes. Quality paper contains 30% post-consumer waste. 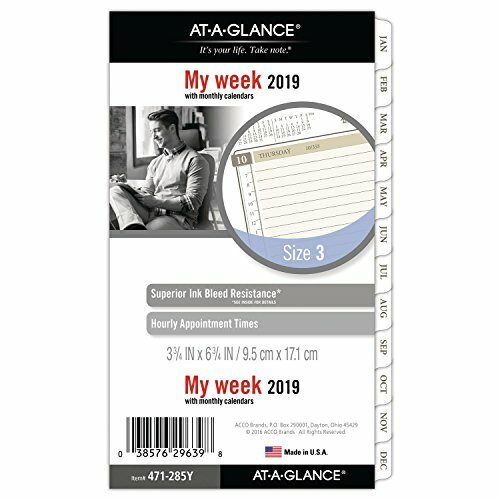 This set is a desk size planner refill, each page measures 5-1/2” x 8-1/2” and is pre-punched for easy insert into a 7 ring planner. 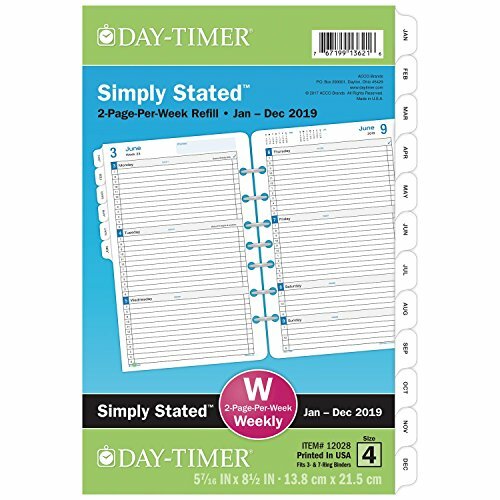 Refill your planner with the Day-Timer 2-pages-per-month desk size that gives you a set of 12 monthly planning calendars on heavy-duty loose-leaf sheets. Available in quarterly starts: January - December, april - may, July - June or October - September. The 2-paged-per-month spread is perfect for organizing your daily schedule with large, ruled block and Sunday through Saturday scheduling. Past and current month’s reference on the bottom of ever monthly two-page spread for quick date checking. Ruled to be done and notes space on the right hand page of every monthly spread gives you plenty of room to jot down important daily details. Months are tabbed for quick date look-up. Includes spacious monthly to-do and diary sections. Fits desk size 7 ring binder. Page size is 5-1/2" x 8-1/2". Dated weekly/monthly refill runs 12 months from January - December with Julian dates. 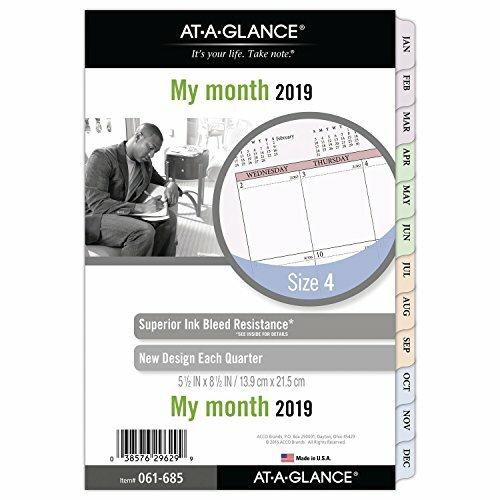 High-quality paper features superior ink bleed resistance; one week per two page spread includes hourly appointment times for detailed plans from 7: 00 a.M. - 6: 00 p.M. Mon - Fri; Sat/sun dates are condensed with 7: 00 a.M., 12: 00 p.M. And 6: 00 p.M. Ticks. Tabbed, one month per two page spread features ruled daily blocks for detailed event planning, and an extra column for notes. Refill pages are loose-leaf and 7-hole punched. Planner cover sold separately.